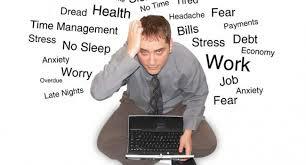 Back to Life Basics: STRESS? 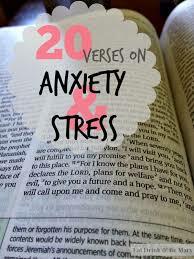 Are you a Christian drowning in stress? 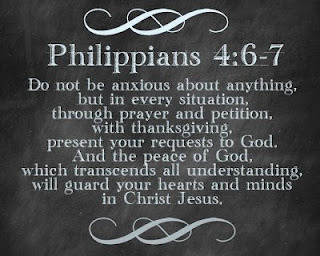 Peace and grace to you all in Jesus great name! Have you ever heard the expression "the elephant in the room"? You know, that area of our lives that is undeniably present but no one wants to talk about? No one wants to acknowledge or even really admits exists? Everyone has those at times including myself. For some people it is facing the reality of a recently lost loved one. For another it is dealing with rapidly increasing debt or the threat of foreclosure. It could even be the stress of Christmas approaching, an upcoming trip to Disneyland, a nosey neighbor or just plain old worry about??? 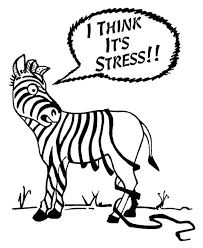 The elephant in the room for many people including within the church is STRESS! You know, the kind that causes rapid heart rate, shortness of breath or other very real health issues. 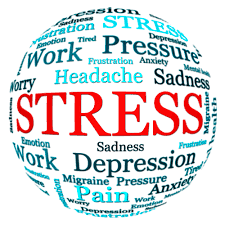 There are of course many folks who have verifiable health issues who need a doctors care and some form of medication to control stress. Not everyone is the same and not all precursors to a stressful situation are the same. They can come in various forms and last for short periods of time or in some people's lives can become a constant integral part of their lives. Several years ago I wrote an article entitled " THE TYRANNY OF HECTICITY". Oh, yes I do realize that "hecticity" is not a word found in Webster's but is should be! In fact maybe we should start a hecticity drive for the acceptance of a new word. Did you know that for the average person who is not experiencing a severe tragedy of some kind, that it is possible to NOT ACCEPT STRESS? By the way, I am not writing this article because I have discovered some new formula or anti stress juice for sale at just $2.98---but only if you call in the next 5 minutes because supplies are limited. Don't you just hate that? Do those T.V. advertisers think we are all idiots? Well er, perhaps they do. I am not totally stress free myself but at the ripe old age of ? (it's none of your business), I have come to the conclusion that many outside influences that affect my life are really within my own control. I can accept the personal consequences of someone else's actions or I can reject them. I can choose to lose sleep over something I have zero control over or I can say NO! Did you know that NO is a very powerful word? Like in "what about NO do you not understand?" When I learned the value of NO as a young pastor it set me free. At the same time I learned that I do not have to know the the answers to everyone else's problems. But that's another story for another time. I really do not want you to think my statements about NO are in any way callused because I sincerely care about people and what is bothering them. But I have learned that as human beings we can make decisions in our lives (and encourage others to do so), that will lead to peace, not stress. 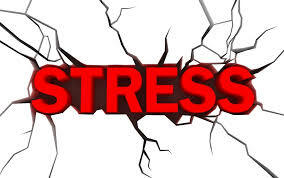 I want to give you an example of something that happened to my wife and I many years ago that was STRESS ON STEROIDS. 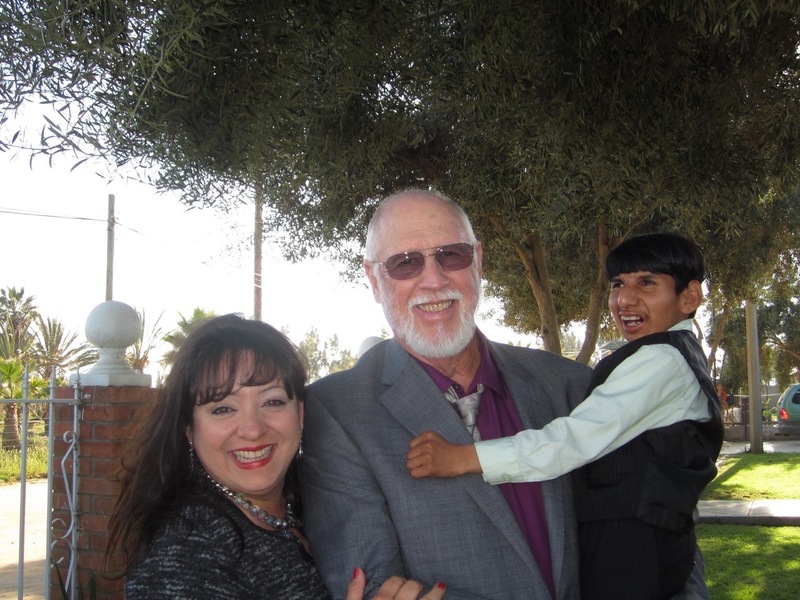 At the time I was Senior Pastor of a rapidly growing missions organization and our field headquarters was in Mexico. We were dealing with local churches and visiting church groups from all over the United States and Canada. We were blessed with a fairly robust group of missionaries and as such reputation means a lot. Not in a prideful way but still it is something to carefully nurture. I was sitting at my desk one day speaking on line one. Line two began to ring so I asked one of my guys to answer the phone. Almost immediately I knew from the look on his face that all was not well. As it turned out a missionary from another town and another organization was telling our missionary "I just want you to know that we all feel so sorry for you people because of what Rance and Brandy have done. It is so horrible that they have stolen all the money from your missions organization and snuck out of Mexico". Now bearing in mind that our guy was sitting six feet away from me at the time, he said, Whoa pardner not true, pastor Rance is sitting right here looking at me. The other missionary said " Oh don't worry you don't have to cover up for them and I want you to know that I am calling everyone I know about this so we can all be in prayer for you poor folks" AND HUNG UP! Ever been the victim of vicious rumors? 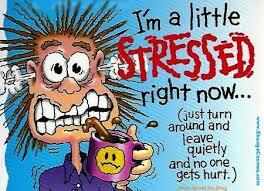 That is STRESS! Can I possible explain to you what kind of stress that can represent when you find yourself the subject of an area wide scandal of that nature? People of God or no, folks have a tendency to believe whatever they have heard last. And the problem is that when someone thinks ill of you, no matter what you may say in your own defense, that seed of doubt has already been planted and is extremely difficult to over come. At this point I had a choice to make. I could either react and fight rumors or I could find another way. So, I chose to go another way and it worked. Rather than fight and try to defend myself, I chose to pray. And of course my wife and our missionaries did as well. The result was that gradually people came around and would say things like, "you know we heard all this evil stuff about you but realized you have never said a bad word back about this other person and you are still here on the job. By the way what ever happened to that person who said those things about you. They don't seem to be around any more"! Since that time many years ago I have applied a simple rule to my life, my family and my ministry. Simply this; If I fight my own battles I will lose every time. If I allow the Lord to fight my battles for me, I will win every time. Do you know that we were able to pass through that miserable time with very little stress---and the problem---the rumors all went away. To this day I catch myself slipping into stress from time to time but then I remember that minus some earth shattering situation, I can choose NOT to accept stress. I can also choose not to be insulted, not to have hurt feelings, and not to jump to someone else's tune. I can choose to live in peace with myself and others no matter what they may chose for themselves. So here are some things I have discovered that may help you in your life. And by the way, these things do not come easily, it takes commitment and practice. 1). 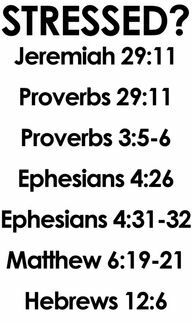 The word "PEACE" is mentioned in the Bible a minimum of 450 times. I have learned as a pastor that sometimes in life you cannot simply throw scripture at a problem and it immediately goes away. Still we are followers of Christ and when we draw near to Him He draws near to us. 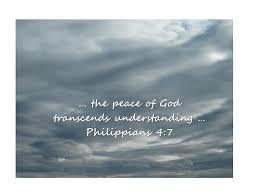 Ephesians 2:14 says "For He Himself is our peace". In my opinion, mankind cannot find true peace within himself. Only the Lord can provide that in our lives but we must be willing to accept that gift from Him just as we accepted his gift of Salvation by grace. 2). 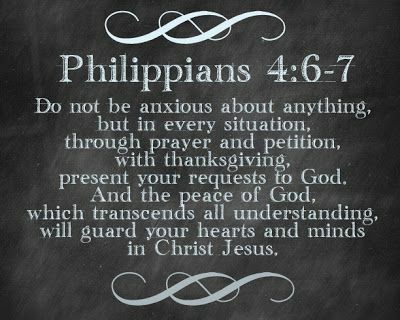 Praying in the midst of turmoil brings peace. I know some folks speak in terms of "My prayer closet" which is a nice turn of words but really all that means is getting alone someplace and talking to God. I also believe that the greatest form of praise and worship is when God knows that we trust Him with our lives. So the question is simple; Do you trust the Lord with your wife and children as much as you trust Him to care for you? 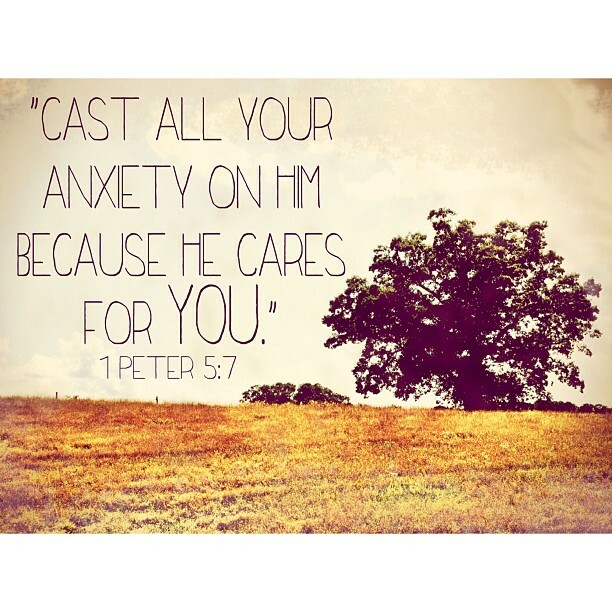 Do you trust Him with your problems? 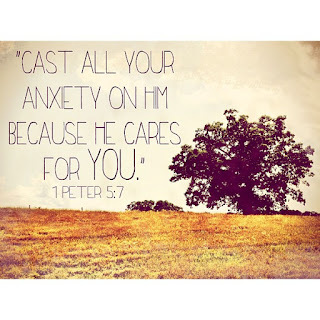 Worry is a natural emotion of mankind but are you spending more time worrying than praying? And before you think I am more than I truly am, frankly I have a tough time with prayer. It is not my first natural instinct. I am not a "prayer warrior". I am just a man who has discovered that I am not in control. I am simply a guy who has discovered who is really in control and my prayer time generally is a running conversation throughout the day. As in, I have a problem here Father and don't have a clue what to do about it. I need you to help me, Amen. There are certainly times that I pray more than that but I think you get my drift. 3). When I feel myself getting stressed out, I try and take care of what ever it is rapidly and then stand back from it. Go sit down, put your feet up, close your eyes and take a deep breath. Ask the Lord to bring your peace back to you. 4). My wife and I do not handle counseling or any other contentious things in our own home. We go out to others to do those things but reserve our home as a place of peace. We are a normal human married couple and sometimes we have problems between ourselves just like anyone else. When those times rear their ugly heads it is generally because we have allowed the Tyranny of Hecticity to steel our joy. One of us gets snarky and snappy with the other. Much more so myself than she by the way. As a family we reset frequently. That means we talk through our schedules and cut things that have begun to encroach upon our family peace. As humans we all tend to, as they say, "bite off more than we can chew". Sometimes our peace is dependent upon asking ourselves a very critical question. Is this thing that I (or we) are doing really necessary? Is doing so improving our lives or bringing with it activity that is unproductive to our personal lives? Do I really need to do this? Is this taking away from my time with my family? 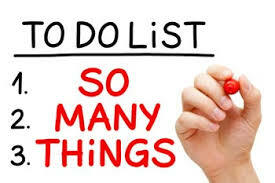 Am I running all day doing "THINGS" and at the end of the day I cannot remember what it was that I accomplished? Am I so tired at night that I collapse into bed only to drag myself out in the morning to do it all again? 5). And finally: Are you taking time off? Do you set aside a day each week to rest and be with family and friends? By the way I do know full well that there are many folks who are raising children alone and have to work day in and day out to put food on the table. Life is not easy for many people. Having said that, I cannot tell you how many Christians confess that the 10 Commandments really do still apply to them but when you ask them about number 4 (a Sabbaths rest), they seem to believe that it is all just some sort of "Jewish Legalism". Well friends the 10 Commandments are not Jewish anything. They are words of wisdom placed into the Bible by the Creator of the Universe. They apply to Jew and Gentile alike. And yes I know we are New Testament creatures saved by Grace not by the law. So let's look at Mark chapter 2 verses 27-28. This is JESUS speaking to us; And He said to them "The Sabbath was made for man, and not man for the Sabbath". Therefore the Son of Man is the Lord of the Sabbath". I know for many people taking the literal day of Saturday off is not practical and may even be required as a work day. But if you are not taking time off to rest you will become a stress cadet. Man was made according to Genesis to walk in the cool of the day in the Garden of Eden with God. Of course Adam and Eve made a grave error which we are still plague with to this very day---handy to have someone to blame don't you think? Mankind was not made to become first responders, warriors, police, fire fighters or corporate raiders. Nearly all of us have to work at things we were not created to do.We were also not made to work ourselves to death 7 days each and every week. Regardless of what day may be available to you, please consider spending a day each week with your family. So very many people, both men and women have lost their families because they lost track of what is important. Including by the way, a church commitment in which you are fellowshipping with people of a like mindset. So here is the deal spoken from a man who is still fighting for a stress free life myself. If you get the following order of things upside down, you are going to loose, and perhaps even shorten your lifespan in the process. 1). First priority is your personal relationship with the Lord. 2). Second only to that is your relationship with your wife and children. 3) Then and only then come job, career, ministry or any outside activity. Say NO to the tyranny of hecticity. Say no to stress. Talk to the Lord and get your peace back. Rance does not solicit funds to operate his ministry. For many years he offered tax exempt status through organizations he has led. As the world changes rapidly so do the expectations of “POLITICAL CORRECTNESS” (PC). 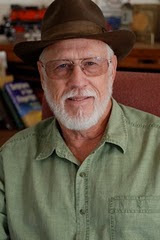 Rance’s articles have been read by people in over 100 countries, some of whom are now threatening to remove tax exempt status from organizations who teach the Bible exactly as written. For some folks the Bible represents a threatening challange to certain life styles and things like abortion, drug abuse, political persuasion and other issues the Bible identifies as harmnful to human existance. While always being aware and sensetive to the feelings of others, Rance refuses to water down the Word of God for the sake of tax exempt monetary donations. Having said that there are some people who appreciate the work of this ministry and occasionally send funds to support our work. For anyone choosing to do so you may contact us through the following address. But please remember no tax deductions are available. More importantly, we would also love to hear from you just to say hi and we sincerely appreciate your prayers.